Chinchillas have beautiful, dark eyes that compliment their big ears and tiny paws. These lovely eyes are usually problem-free but occasionally you may run into an issue with them which will warrant a visit to your exotics vet. It is important to familiarize yourself with some of the more common eye problems chinchillas can get so you are better prepared to spot a problem as soon as possible. Sometimes chinchilla's eyes get scratched or irritated by hay, hair, dust, or even after a struggle with another chinchilla. These scratches or irritations can cause a defect on the cornea of the eye (the clear surface of the eye) known as a corneal ulcer. An ulcer is a painful defect (such as a tear or a hole) and may cause a bit of cloudiness or redness to the eye. 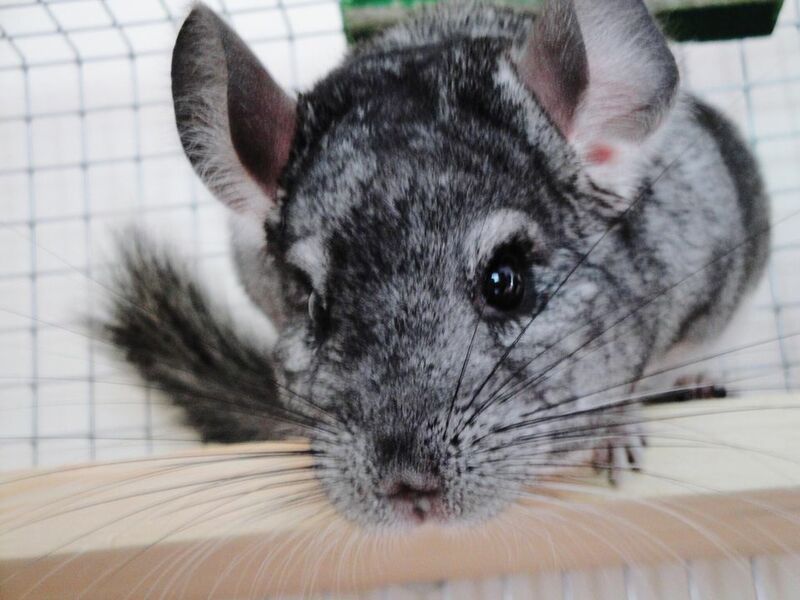 Your chinchilla may paw at the hurt eye, keep their eye closed, or even rub it on the ground. The pain may cause them to stop eating and even develop ileus if it is really bad. Thankfully corneal ulcers may be treated with special eye ointments from your vet. Some of these ointments are antibiotics and some are made specifically to heal ulcers. If the ulcer is really bad or hasn't healed after the use of some medications your vet may obtain some of your chinchilla's blood, centrifuge it (spin it and cause it to separate into different parts), and use the serum that is produced as eye drops to help the ulcer heal. If the ulcer still hasn't healed, a grid keratotomy may need to be performed on the eye to encourage healing. This procedure is done under anesthesia and is basically drawing a tic-tac-toe board on the cornea itself with a sharp object such as a needle to encourage the body to heal a bunch of small squares instead of one large ulcer. If your chinchilla's eye gets irritated for some reason or exposed to excessive amounts of bacteria or fungal spores it can get infected. Bacterial and fungal infections can affect one or both of your chinchilla's eyes and they need to be treated with the appropriate antibacterial or antifungal medications. Your chinchilla may have hair loss around their eye, redness (conjunctivitis), discharge, swelling, and even keep their eye shut if it hurts. Your exotics vet may choose to treat the eye without obtaining a culture of the eye discharge first but if the problem does not resolve, or if you want to do the best thing possible for your chinchilla, a bacterial and/or fungal culture should be obtained. The culture will tell your vet exactly what bacteria or fungus is growing around the eye and will allow them to pick the correct treatment for your chinchilla. If your chinchilla has a lot of discharge from their eye and it is crusting shut, you can use a warm, damp, cloth to gently clean it until you can see your vet. Chinchilla teeth don't technically have roots but the part of the incisors (the front teeth) that would normally be considered roots can grow into the nasal-lacrimal duct and cause your chin's eye to weep. An easy test for this problem is to use fluorescein eye stain and wait to see if it leaks out of your chinchilla's nose after dripping it into the eye. Normal nasal-lacrimal ducts flow through the nose and allow drainage from the eye but if that duct is blocked or clogged, excessive drainage will occur from the eye like a clogged pipe. Sometimes tumors will develop behind the eyes of chinchillas. These tumors can cause an eye to bulge, swell, and be very uncomfortable. Sometimes radiographs (x-rays) will show a suspected tumor on the skull and your vet may want to send the radiographs off to be read by a radiologist to confirm it. If nothing shows up on an x-ray an MRI may be recommended if your vet still suspects a tumor. Many other problems can arise with your pet chinchilla's eyes but regardless of the issue, if you think something is wrong with your little friend make an appointment with your exotics vet as soon as possible. Chinchilla's often stop eating and develop life threatening ileus if they do not feel well or are in pain so catching an eye issue before it causes other problems is important to your chinchilla's overall well being.